Private Clarence Bray (Service no. 5975) was in school at Mount Kembla when his father was killed in the mine disaster of 1902. 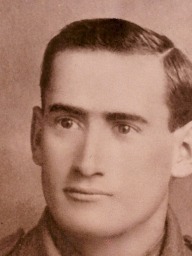 He enlisted in 1915 and listed his mother as next of kin. He married Hilda Shearer prior to embarking with D Company 2nd Battalion on HMAT A18 Wiltshire on 22nd August, 1916. He served on the Western Front and on the 11th April, 1918 he received a gunshot wound to his back during heavy fighting to stop the German breakthrough. He was returned to Australia in April 1919 and discharged from the AIF on 2nd June, 1919. In 1918 his file noted a change of next of kin to his wife and added a 2 year old son.